Pottawattamie County is a county located in the U.S. state of Iowa. At the 2010 census, the population was 93,158. The county takes its name from the Potawatomi Native American tribe. The county seat is Council Bluffs. 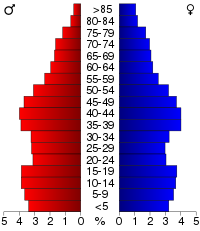 Pottawattamie County is included in the Omaha–Council Bluffs, NE–IA Metropolitan Statistical Area. According to the U.S. Census Bureau, the county has a total area of 959 square miles (2,480 km2), of which 950 square miles (2,500 km2) is land and 8.9 square miles (23 km2) (0.9%) is water. It is the second-largest county in Iowa by area. Due to movement of the Missouri River and a Supreme Court ruling, part of the county, Carter Lake, actually lies on the far side of the Missouri River. This part of the county cannot be reached by road without entering Nebraska; no direct bridge exists. The 2010 census recorded a population of 93,158 in the county, with a population density of 97.62328997.6233/sq mi (37.69256337.6926/km2). There were 39,330 housing units, of which 36,775 were occupied. At the 2000 census, there were 87,704 people, 33,844 households and 23,623 families residing in the county. The population density was 92 per square mile (35/km²). There were 35,761 housing units at an average density of 38 per square mile (14/km²). The racial makeup of the county was 95.98% White, 0.77% Black or African American, 0.37% Native American, 0.48% Asian, 0.02% Pacific Islander, 1.27% from other races, and 1.11% from two or more races. 3.30% of the population were Hispanic or Latino of any race. There were 33,844 households of which 32.30% had children under the age of 18 living with them, 53.60% were married couples living together, 11.80% had a female householder with no husband present and 30.20% were non-families. 24.90% of all households were made up of individuals and 10.00% had someone living alone who was 65 years of age or older. The average household size was 2.54 and the average family size was 3.03. 26.00% of the population were under the age of 18, 9.10% from 18 to 24, 28.60% from 25 to 44, 22.70% from 45 to 64, and 13.70% who were 65 years of age or older. The median age was 36 years. For every 100 females there were 95.50 males. For every 100 females age 18 and over, there were 92.60 males. The median household income was $40,089 and the median family income was $47,105. Males had a median income of $31,642 vand females $24,243. The per capita income was $19,275. About 6.40% of families and 8.40% of the population were below the poverty line, including 11.00% of those under age 18 and 6.30% of those age 65 or over. The population ranking of the following table is based on the 2010 census of Pottawattamie County. Pottawattamie County is served by the Pottawattamie County Sheriff's Office consisting of 51 sworn deputies, 13 reserve deputies, 92 detention officers and eight civilian support staff. 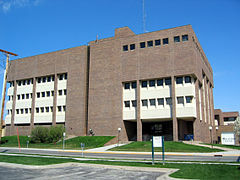 Its headquarters is located in Council Bluffs, Iowa. Pottawattamie County is a strongly Republican county. The county last backed a Democratic presidential candidate in 1964 as the party won nationally by a landslide, & only voted Democratic in four other elections prior to that. However, some recent elections have become more competitive, with Barack Obama losing the county in 2008 by less than 1,000 votes. In contrast, Donald Trump won the county by over 21 percent in 2016. ^ The leading “other” candidate, Progressive Theodore Roosevelt, received 4,538 votes, while Socialist candidate Eugene Debs received 489 votes, Prohibition candidate Eugene Chafin received 93 votes. ^ Pottawattamie County, Iowa Archived 2009-05-27 at the Wayback Machine, Pottawattamie County, 2007. Retrieved September 5, 2007. ^ United States Office of Management and Budget. "Update of Statistical Area Definitions and Guidance on Their Uses" (PDF). pp. 5, 36. Archived from the original (PDF) on May 14, 2006. Retrieved July 21, 2006. ^ "Population & Housing Occupancy Status 2010". United States Census Bureau American FactFinder. Retrieved June 1, 2011. ^ "Pottawattamie County Sheriff's Office". Retrieved May 2, 2016. ^ Leip, David. "Dave Leip's Atlas of U.S. Presidential Elections". uselectionatlas.org. Retrieved 2018-04-27. Wikimedia Commons has media related to Pottawattamie County, Iowa.